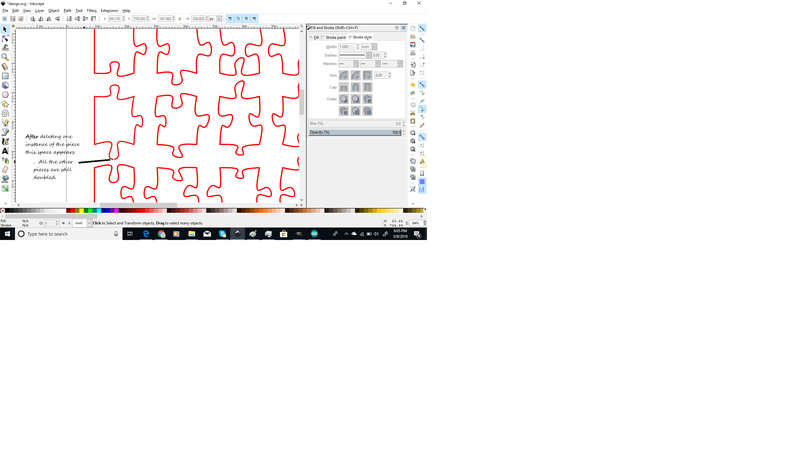 A couple weeks ago I posted about how to generate random jigsaw puzzles from code and promised to follow up showing how the code could be used to carve puzzles from any design in Easel. 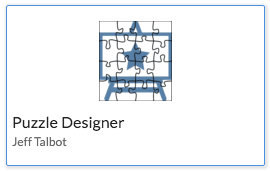 I've just released a new Easel app called "Puzzle Designer:"
The code for the app is open source and licensed under the MIT license. Decide how many rows and columns, and thus how many total pieces you want. Changing these parameters will not affect the total size of your puzzle, it will only change the size of the pieces. (The size of your puzzle is always the size of your original design). Notice how there are a lot of steps involved! This is not ideal. In fact, I was inspired to build this app by @Vk1's work on his own Puzzle Generator app, and to use it as a case study in improving the programming framework that developers use when building Easel apps. There are a number of limitations in our framework right now that make both the process of building apps and the experience of using apps harder than they should be in some cases. For example, apps cannot specify the outline style (inside/on path/outside) of a given cut. They also do not receive information about the cut depths of your original design. We are going to be working hard to eliminate those shortcomings over the next few months. I hope you enjoy using the app. I'd love to hear your feedback on it and see what kind of puzzles you make! I agree, I can build apps and have done so but no been happy enough to get them "released". My main concern is exactly what you found, basically just returning a SVG. Having information and control of cut type is vital in app as is bit size. A nice to have would be material thickness and depth on selected objects that are passed into the app. I've done a few apps for cutting grilles and they work great, but I know all the gotchas but have no control for another user. One other thing I think would be useful on all apps, a pop-up information panel where you can write a sensible amount of text/pictures, maybe using markdown or similar. That way the apps can be self-contained and not need to find the forum posting to find out more. I agree, @IanWatkins. I'll let you know as soon as we have an early working version of v2 of the API. Way to bury the lede there @JeffTalbot. 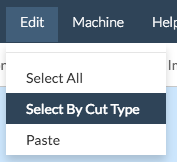 Select by cut type???? Holy guacamole batman! When did this feature hit shelves? @Mike used "Select by cut type." It's super effective! I think this APP is great. It also allows me to do a much bigger design on a smaller machine. Could you add shapes selection. I would really like to have the same functionality but instead of puzzle shapes, break it up in square blocks. That would be really handy. That sounds like it would almost be a separate "mosaic" type app. Does sound useful. Any developers out there want to make that? Thanks for your feedback. It would be great if you can create something like that. I have tried breaking up an image into blocks in my graphic editor, but not having success. I just have one concern. This topic is so old, do you think anyone else will see this proposal to comment? Maybe not. Maybe you could post a new topic in the apps category asking if anyone else would be interested in a mosaic app? Question… Im making a large puzzle 1200x1200mm with X-carve iv understand I need to separate all pieces and cut them individually so they fit the machine, after generating the puzzle all prices are set to FILL, the only confusing thing is if should i just cut them or need to set cut to OUTLINE? or delete the BLACK cutting from bit size? You shouldn’t need to change any settings on the generated puzzle shapes. The app uses the v2 version of our app framework, which lets it set the outline cut styles properly. I’m not sure what you mean about the “black” cutting? If you share your project URL, I could take a look and maybe get a better idea about what you mean. I had great success using this to generate a puzzle for my laser. I have a question that is probably pretty simple. Then I choose your puzzle generator, 5 by 5, add spaces. I then select 1/32" bit, cut on path. I then download as svg file. I open inkscape and import the svg. Now I have individually selectable puzzle pieces. What I noticed after watching my laser cut this file the first time was that instead of making the 2 passes I told it, it was starting to make 3 passes. (actually it was doing each object twice because they appear twice in the file, then after all pieces were cut, it was doing the laser software requested 2nd pass). I went back to my inkscape file and found that each puzzle piece is in my file twice. The interesting part is that when I delete one of the puzzle pieces, the duplicate actually looks like it has a tab (ie. not cutting the whole piece). The piece is not solid. I have repeatedly checked and no tabs are set to be cut that I can tell. -I want to have just 1 instance of each puzzle piece for my laser to process. Any idea how to do this? When I delete a piece, sometimes the object left is not entirely cut, It has white space. I’d like to have 1 continuous piece, without a space. The puzzle it made was really nice. I’m cutting using glowforge against 1/4" baltic burch. 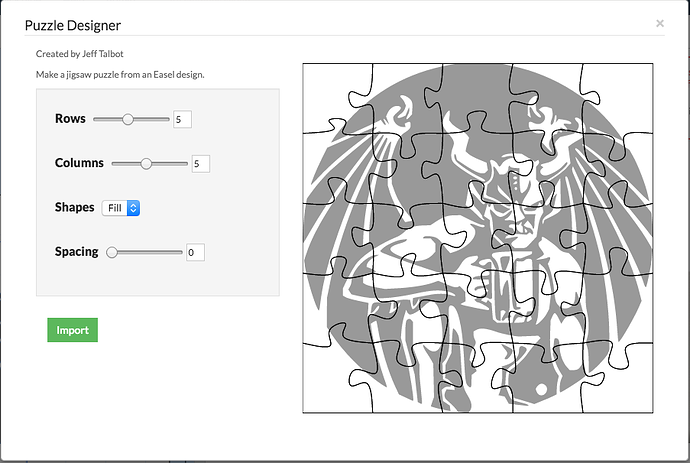 The puzzle designer app is designed to carve the actual puzzle pattern in addition to just cutting the pieces. So, for example, if you select a star instead of a rectangle, it will generate a puzzle with the star in the center, so that when you put the puzzle together, you see the star. Since you are just selecting a rectangle, it assumes the rectangle is the design for the puzzle. That’s why it fills every piece. What I think you can do is after you import the puzzle in Easel, select “Edit / Select by Cut Type” and select all fills. Then delete them. Then you might also want to set the depth of all the pieces to something other than all the way through the material (just to make sure no tabs will be set). That should get rid of the duplicate objects. Then you can export to SVG. thanks, I will try your suggestion. I did find a workaround. The objects I want to keep are on top so I move the pieces away, then delete the underlying pieces with a mini-tab. Then I have all my pieces for the laser. I’ve searched the internet and to me this looks like the best puzzle generator. I’m really grateful for this years addition to easel of exporting to svg. I have used that feature on 2 separate occasions. I am brand new to your site, your process, software, machines, and apps. That said I’m not new to 3D printing, Gcodes, CNC Lasers, etc. In fact my son and I are preparing to build our own CNC Laser/Etcher. Now seeing the Xcarve, etc I want one!! I stumbled upon the Puzzle app and want to see if it will work for what I want to create. I have a friend who is a puzzle maker for a company. 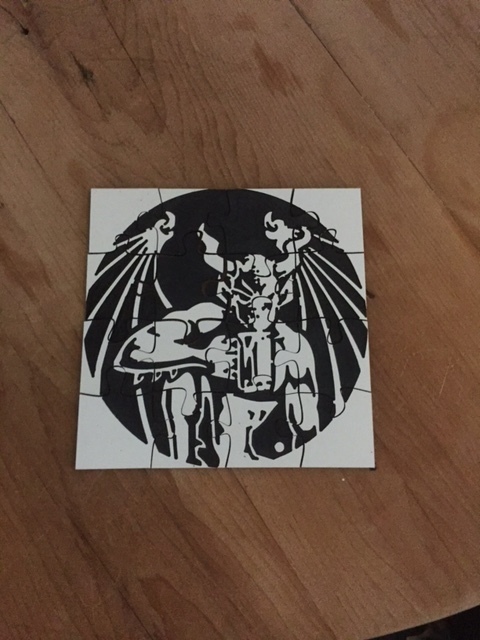 After joining our local Makers Space she created puzzles using the labels from her puzzles on Acrylic and cut it with a CNC Laser but in order to create the pieces she uses Adobe Illustrator and freehands the pieces thereby allowing her to customize pieces in the puzzle that go along with the theme of the puzzle. This is a picture of one she created with Doxies in it because I’m a Doxie Addict. What I wanted to find out is if your app would allow us to customize pieces throughout to make those customization s? If so it would save a ton of time, but also eliminate the need for me to learn Adobe Illustrator to accomplish it. I have a guitar picture that I scanned from one of my sons prints and am having labels made of it in order to create some acrylic puzzles. We essentially affix the label to the acrylic and use the laser and programs to do the cutting. What types of customizations do you want to make to the pieces? Your “doxie” pic did not post. The app doesn’t currently support customization of the pieces, but I’d be interested to see what you had in mind.